Delicious Antojitos are a perfect appetizer for any occasion. 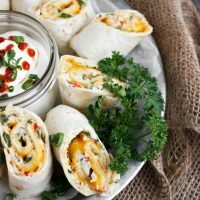 Featuring tortillas filled with cream cheese, diced vegetables and cheddar cheese are rolled, baked and cut into bite-sized pieces for a quick and easy appetizer. This antojitos recipe is very much fashioned after that restaurant version and it’s one of my favourite small bites. They are quick and easy to make, so if you’re still looking for some football food inspiration, this would be a perfect addition to your menu for Sunday’s big game. 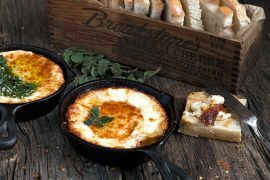 These little bites start with a mixture of cream cheese, mixed with finely diced red pepper, jalapeno and green onion. 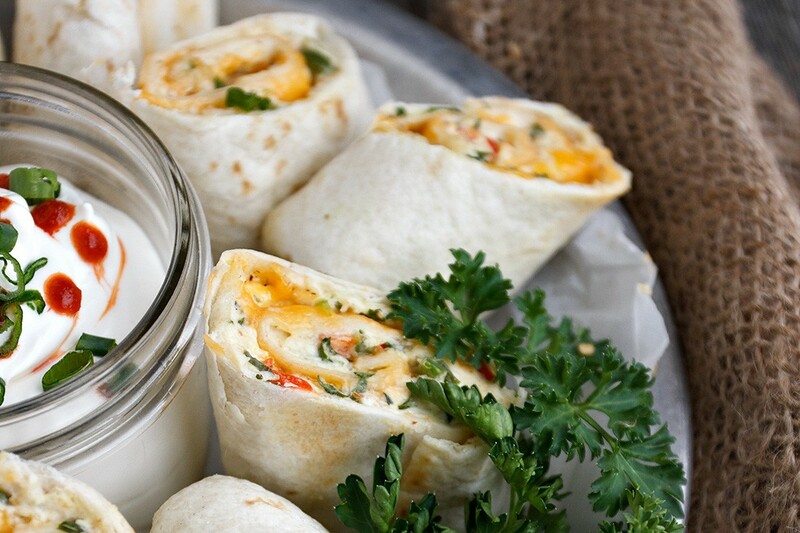 This mixture is spread on large tortillas and topped with cheddar cheese. They are then rolled, baked until melty and slightly crisp and then cut into bite-sized pieces. These can be made ahead (simply wrap and refrigerate after rolling/before baking). Or freeze them for longer storage, to have them ready any time to enjoy. The bread crumbs simply act to bind the filling together a bit (make it firmer when warm). If you don’t have any bread crumbs, just omit. Your filling will be a wee bit looser, but it won’t affect the finished taste at all if you leave them out. Any hot sauce you have on hand is fine, or leave out if you’re not wanting the extra bit of spice. I used Tabasco™ sauce – a half dozen drops or so. Sriracha would also work. Adjust the amount based on the how big a spice punch your sauce packs. 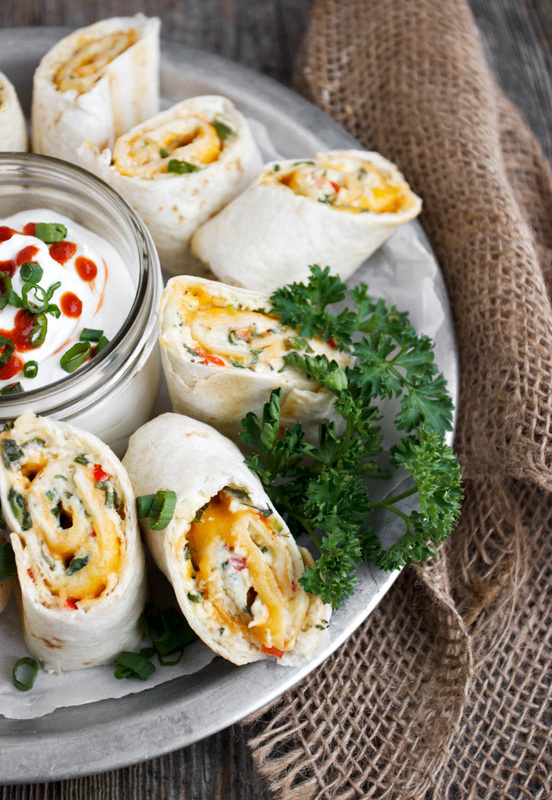 Be sure to dice your vegetables fairly small, so your tortillas can be rolled tightly and evenly. If you’re like me, you may be tempted to up the cheddar cheese in the filling, as it doesn’t seem like a lot the first time you make them. Trust me though, it’s enough. It’s a good balance with the other ingredients and it keeps these bites from getting too greasy. With 1/4 cup diced jalapeno, these rolls are pleasantly spicy. They are unlikely to be too spicy for most adults. Kids used to eating jalapeno or similarly spicy foods, should also find them fine. If you’re feeding a really heat-averse group, reduce to 2 – 3 Tbsp. or so. I like just some green onion and a bit of Sriracha in the dip for these Antojitos. In the restaurant mentioned above, they serve the sour cream with a dollop of pesto, but it always seemed an odd choice to me for a Mexican-inspired dish. Make these ahead by wrapping well with plastic wrap and refrigerating up to 24 hours, after rolling, but before brushing with butter/baking. Allow a few extra cooking minutes if they are cold when they go in the oven. You can also make these ahead and freeze them. Double wrap with plastic wrap and freeze, after rolling, but before brushing with butter/baking. Thaw at room temperature or in the fridge overnight before baking. Note that the recipe above makes 12 individual pieces (from 3 rolls). They are a fairly generous size though, so you won’t need a bunch per person. But, you can easily double/triple recipe as needed, to make more! Makes 12 individual pieces (from 3 rolls). Double/triple recipe as needed, to make more. Can be made ahead. See end of recipe instructions for details. Place cream cheese in a microwaveable bowl. Microwave for 10-15 seconds, just to soften (give it another 5-10 seconds if cream cheese is cold, but be careful not to melt!). Add the rest of the filling ingredients to the bowl and mix thoroughly to combine. Be sure to add salt and pepper, to taste. Lay out 3 large tortillas. Divide the filling between the 3 tortillas. Using an offset spatula or the back of a spoon, spread the filling over the tortilla, getting as close the edge as you can. Sprinkle the shredded cheddar cheese over-top, dividing it between the 3 tortillas. Roll up tortillas: With the tortilla in front of you, fold in about 3/4-inch of the tortilla over the filling at the 3-o'clock and 9 o'clock position, just to straighten up the sides a bit. Then, starting with the edge closest to you, roll the tortilla up jelly-roll style. Place on a baking sheet, with the seam down. Repeat with remaining tortillas. Cut the tortillas: Brush tortillas with melted butter, then make 3 slices about halfway through (not all the way through!) the roll as shown here - / | (so with tortilla horizontally in front of you, about one quarter in from the left, make one diagonal slice to the right, then make one slice in the middle straight up and down and then one quarter in from the right, make one diagonal slice to the left. Bake tortillas for 18-20 minutes, or until crisp and golden. Remove from oven and finish cutting through the slices you made before baking to make 4 pieces from each roll. Serve with sour cream garnished with diced green onion and a splash of Srirarcha, if you like. These can be made ahead. 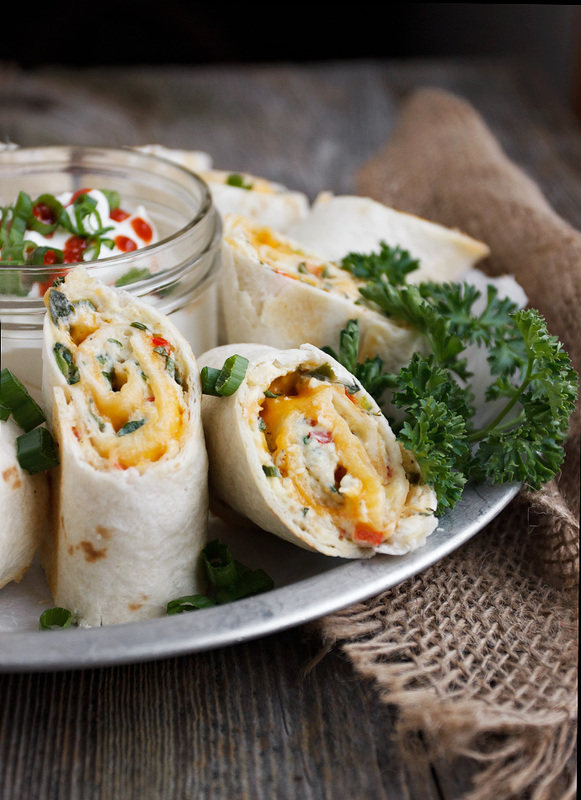 Wrap well in plastic wrap and store in the fridge for a day or double wrap and freeze. Thaw at room temperature in wrapping, then brush with butter, slice and bake as usual. How did I miss this post? These are way more than football food – they are a great lunch, dinner, picnic, camping, travel or party appetizer! So pretty too – thanks Jennifer – have a wonderful week. 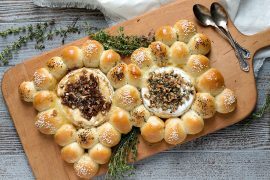 What tasty bites and just perfect for football season! The Super Bowl may be over (and my team may have lost), but I can NEVER get enough small bites! LOVE these antojitos, Jennifer!! I always called them roll ups, so thanks for teaching me a new word! 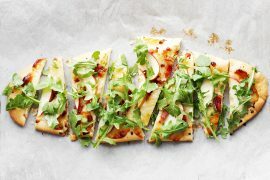 ;) Totally making these one day this week and calling it dinner! Pinned! Cheers! Thanks Cheyanne and sorry that your team lost :( I think these would make an excellent dinner! These sound so easy and totally love that you can freeze them. I love your section, Cook’s Notes! So helpful! When do you put the shredded cheese? After you spread out the filling on the tortilla?